The June US ISM manufacturing index has beaten expectations, hitting a four-month high of 60.2 – consensus was expecting a drop to 58.5 from 58.7 given somewhat mixed regional surveys. The ISM is at levels that have historically been consistent with GDP growth of around 7% annualised with the survey only coming in higher on five occasions over the past 30 years. 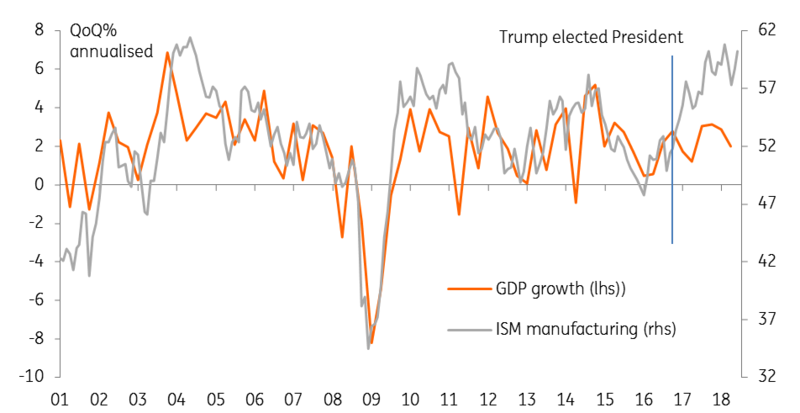 ISM survey vs GDP - the Trump effect? The details show production is incredibly strong at 62.3 while new orders are even better at 63.5. However, it was the supplier deliveries component that was responsible for the bulk of the rise in the headline index. It jumped to 68.2 from 62.0 with firms clearly struggling to meet the demand in the economy. Firms are increasingly highlighting supply bottlenecks as a major constraint for them, be it the lack of labour with the required skills, a lack of inventory on components, a lack of delivery drivers or some evidence of hoarding in the wake of tariff announcements. Either way, this suggests price pressures will increasingly build in the economy as evidenced by the prices-paid component, which was up to 76.8 (50 is the break-even level). In fact, the proportion of industries 'paying higher prices' hit 100%. The report was strong throughout with employment remaining in line with its six-month average at 56.0, suggesting another healthy gain in manufacturing jobs on Friday. Export orders are also very good at 56.3, which again suggests the trade rhetoric is yet to bite in terms of activity. Nonetheless, the report did state that survey respondents are "overwhelmingly concerned about how tariff-related activity is and will continue to affect their business". This report tells us that despite market nervousness about trade wars, the US economy is going from strength to strength. In fact, the recent data flow suggests that we should be looking for GDP to come in at around 4% for 2Q18 while inflation is likely to hit 3% in the next couple of months. This will keep the Federal Reserve tightening policy with two more hikes looking likely this year. Nonetheless, the longer the trade uncertainty continues, the more likely we will see real economy effects. A combination of weaker equity markets and growing corporate caution could result in much slower growth later in the year.